New Ducker Worldwide research for the steel industry shows how automakers have since 2013 ditched more than 153.9 pounds of mild steel for lighter, likely tougher materials. Some of this mild steel was replaced by the rival metal aluminum and other substances. But a large amount appears to have been exchanged for advanced high strength or dual-phase steels, which start around 500 megapascals, and ultra-high-strength steels of 780 MPa or more. These steels often carry repair restrictions not found on mild steels because of the lighter, stronger grades’ metallurgy and role in crash energy management. Heat exposure and even cold straightening can alter the properties of the more complex steels. The 110.3 pounds of mild steel lost on the average American light vehicle between 2010 and 2013 gave way to 63.2 pounds more bake-hard and high-strength steel (a mix which kicks in around 210 MPa), 15.7 pounds more advanced high-strength steel, and 16.1 pounds more ultra-high-strength steel. Between 2013 and 2018, OEMs were cutting the more basic of the higher-strength steels as well, according to the Ducker research. High-strength steel content fell by 36 pounds, and automakers cut 70 pounds of bake-hard steel. However, advanced high-strength steel content rose by 70 pounds, and OEMs added another 19.9 pounds of ultra-high-strength steel. It’s not a pound-per-pound exchange. The point of upgrading one’s steel is to create a version of the part that can get the job done with less weight. 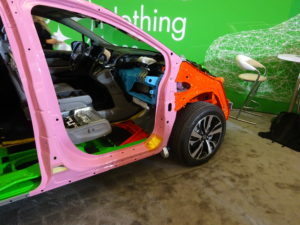 That means body shops are in or passing into the point where lower-strength steels really start to fall by the wayside. That indicates repair procedure adherence and execution become even more important than they already are, and shops and carriers might expect their repair/replace ratio to move more into the replace camp. Ducker determined that the amount of advanced and ultra high strength steel combined rose 120 pounds between 2012 and 2018 for an average of 20 pounds per year. “As OEMs continue to monitor EPA goals and consumer preferences, vehicle launch dates and the expected increase of new vehicles in 2019, translate to further AHSS/UHSS growth in 2019 and beyond,” an executive summary states. Ducker wrote that the steels “have proven mass savings capabilities as compared to mild and HSS/HSLA. This along with the higher strengths for occupant safety remain the key fundamental drivers,” and “there are mass and cost tradeoffs that values AHSS/UHSS over other competing materials,” Ducker wrote. Ducker concluded that “beyond 2020, AHSS pounds per vehicle will decline, while UHSS continues to grow.” That means repair procedures could get even more restrictive. The rise in advanced and ultra-high-strength steel outpaced even Ducker’s projections. In 2013, it calculated that the amount of advanced or higher grades of steel would be 351 pounds in 219 and 483 pounds in 2025. Ducker now forecasts 395 pounds of such steel in 2019 and 570 pounds in 2025, for a net increase of about 175 pounds, or 30 pounds a year. From 2019 to 2025, there will be a net increase of AHSS/UHSS grades of steel of ~175 pounds per vehicle. This translates to an annual average growth of 30 pounds per year. “The time period between 2019 and 2025 will demonstrate accelerated growth for UHSS and will be driven by the OEMs desire to meet global vehicle standards, the expected EPA goals, the number of new vehicle platform launches as well a general increase in vehicle production,” Ducker wrote. Ducker wrote that aluminum would seize some market share between 2018 and 2020, growing to about 13 percent of curb weight and taking a point from iron and steel’s share. This fit with a study it performed for the Aluminum Association in time for last CAR Management Briefing Seminars. However, “Advanced grades of steel will continue to hinder further growth of all competing materials,” Ducker wrote.